Grizzlies will soon emerge from their winter dens in the mountains and travel to lower elevations looking for early green plants. 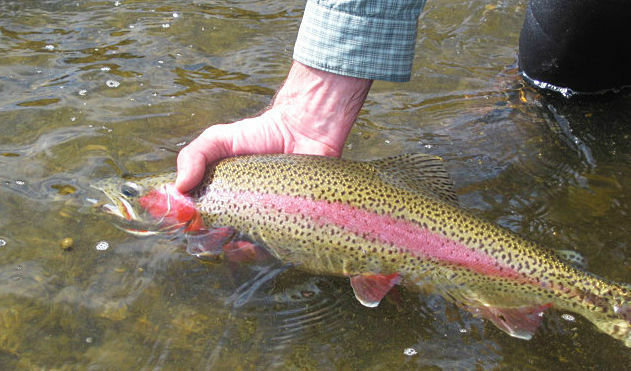 Wild rainbow trout breeding peaks from mid-April to mid-May. Humans are such an odd lot. Animals — under water, on the ground or in the air — are driven by the survival of their species. We fret about home loans, school choice or health insurance. Wild creatures do not. Of course, those critters don’t rush to the hospital when sick, play music when sad or have barbecues on the Fourth of July. Animal behavior is largely driven by daylight length. And right now, we are gaining daylight by leaps and bounds, at least a minute a day and often several minutes daily. Life rushes by like a southbound freight train for most animal species: Hurry up and mate, raise young, prepare for next winter. The month of April at our latitude can start with temperatures more like winter but end with bull elk growing a new set of antlers, rainbow trout depositing eggs in the gravel of rivers and streams, and reports of grizzlies out of their dens on the Rocky Mountain Front. Wild rainbow trout breed in the spring, often peaking from mid-April to mid-May, in rivers and streams with gravel bottoms. Those requirements are important for a couple of reasons. First, the flowing water in a river or stream provides oxygen, which keeps the eggs alive. Second, gravel helps protect eggs from predators. And a silt bottom could smother and kill the eggs. When it’s time to spawn based on daylight length and warming water temperature (at least in the mid-40s), a female rainbow will clear a slight depression, called a redd, in gravel with her tail, then deposit 2,000 to 3,000 eggs. As she releases her eggs a male rainbow will move alongside her and release his milt over the eggs, fertilizing them. And that’s it. The pair swim away and let nature take its course. In a month or two the eggs will hatch. Pretty simple, really. It’s unclear what causes a bear to emerge from its winter den, especially when the den lies under several feet of snow. Warming temperatures, increasing day length, snow melting around a den entrance, and the smells of spring probably all play a role. Eventually bears will move from their high elevation dens to lower, warmer habitats looking for early green plants. In a lush, wet spring, plants like angelica and cow parsnip dominate nature’s menu. But if the prairie is too dry and there’s not much to eat conflicts between bears and humans may happen. So far this year it would appear that a dry spring may be the least of our worries. This spring should be a good one for fish, frogs and boat sales. In the meantime, enjoy April as it unfolds and soak it all in because all too soon we will be complaining about the heat of summer.